Top Private University Bangalore for UG & PG programs which provides admission through management quota or entrance exams. B.Tech/Lateral Entry 2nd Year Admission in Private University Bangalore is open for 2018 Batch. Both B.E & B.Tech Programs offers Students an opportunity to pursue a career in the field of Engineering. The major difference between B.E & B.Tech Programs is that B.E Program is more focused on theoretical concepts of Science & Technology whereas B.Tech Program is more focused on the Practical concepts of Engineering & Technology. Most of the university and private colleges provides B.Tech degree and only VTU Engineering Colleges of Karnataka provides B.E Degree. 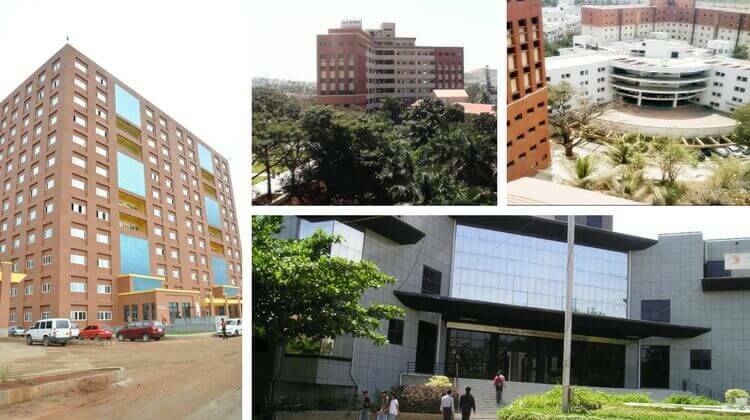 Some of the Top Private Universities in India are Manipal, MIT, VIT, SRM, BITS, AMITY, Kalinga etc which provides a Bachelor degree in Technology. But it is difficult for most of the students to get into these colleges due to a limited number of seats available. 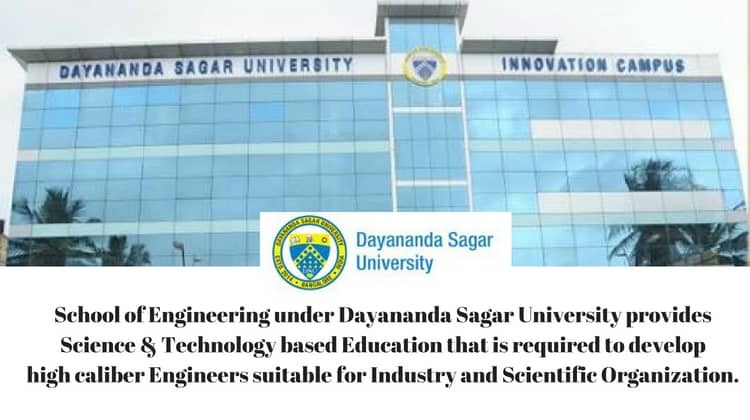 If You are looking for admission in Engineering College which provides B.Tech degree, You can consider the below-listed colleges for admission. PES University formerly known as PES Institute of Technology [PESIT] was established in the Year 1972 and granted autonomy in the Year 2013. PES University Electronics City campus formerly known as PES Institute of Technology, South Campus established in the Year 2013 and granted autonomy in the Year 2018. PES University has two campuses located at Banashankari and Electronic City under People’s Education Trust. Ranked at No. 99 among top 100 private universities in India & Ranked at No. 87 among top 100 engineering colleges in India by NIRF in the Year 2018. Minimum 50% marks in class 12th (10+2) or else Minimum 50% marks in Diploma (10+3) with Mathematics as a compulsory subject. Must have a valid score in NATA entrance exam. Minimum 60% marks in class 12th (10+2) with Physics & Mathematics as compulsory. Minimum 60% marks in Diploma (10+3) in any engineering branch or any equivalent BSc. Degree with Mathematics & Physics as a compulsory subject in class 12th (10+2). 45% of the total seats are filled through PESSAT Entrance Exams, 40% of the seats are filled through Karnataka-Cet and rest 15% via NRI, Management quota. College Tuition Fee is 3 Lakh 20 thousand per annum via PESSAT entrance exams. Hostel Fee is 90 thousand per annum. Amrita School of Engineering [ASE-B] was established in the Year 2003, under Amrita Vishwa Vidyapeetham. It is spread over 25 acres located at Kasavanahalli, Sarjapur Main Road, South Bengaluru. It has 4 other campuses located in Amritapuri, Coimbatore, Mysore, Kochi. Ranked at No. 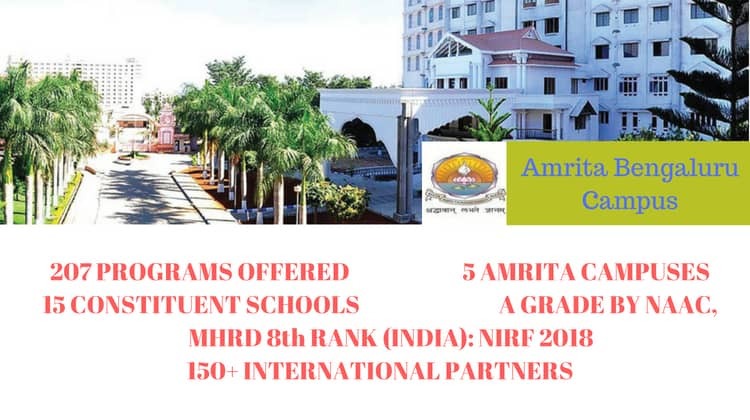 8 Position among top 100 private universities in India by NIRF 2018. Accredited as A grade college by NAAC. Computer Science, Electrical & Electronics, Electronics & Communication, Electronics & Instrumentation, Mechanical Engineering. Minimum 60% marks in Physics, Chemistry & Mathematics in Class 12th (10+2). College Tuition Fees is 2 lakh 10 thousand per annum. Hostel Fee is 85 thousand per annum. MSRUAS was established in the Year 2013, Under Gokula Education Foundation Trust. The University Campus is located at Peenya Industrial Area where B.Tech & M.Tech classes are conducted. Approved by UGC, New Delhi. Ranked at 90th position among top 100 Private University by NIRF in the Year 2016. Aerospace, Automobile, Civil, Computer Science, Electrical & Electronics, Electronics & Communication, Mechanical Engineering. Minimum 45% marks in Diploma (10+3) in any engineering branch or any equivalent BSc. Degree with Mathematics & Physics as a compulsory subject in class 12th (10+2). 60% of the total seats are allotted through ComedK, Uni-Gauge Entrance Exams & Management Quota. 1 lakh 83 thousand per annum through ComedK & Unigauge Entrance exams. Management Quota Seats 250000 per annum. For NRI Students 21 thousand USD for the entire course. Additional Students Facilities fee per annum is 21000 per annum for all students. 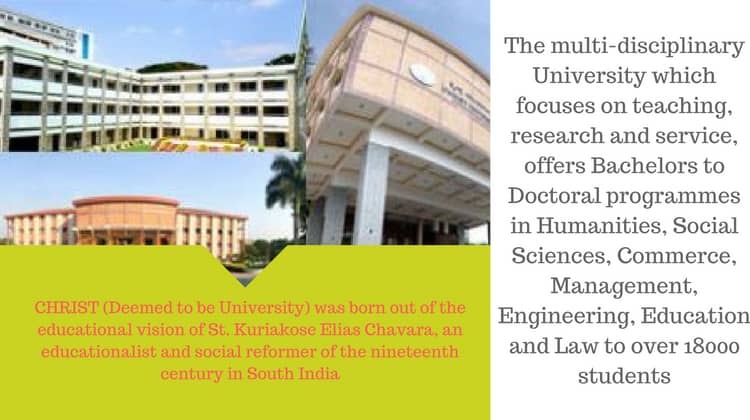 Christ University was established in the Year 1969 as an autonomous college and granted autonomy to be a deemed university in the Year 2008. The Faculty of Engineering, Christ University was started in the Year 2016. Christ University Engineering campus is spread over 60 acres located at Kengeri on the Bangalore-Mysore road. Approved by UGC, New Delhi & Council Of Architecture (COA). Accredited as A grade college by National Assessment & Accreditation Council (NAAC). Architecture, Automobile, Civil, Computer Science, Electronics & Communication, Electrical & Electronics, Information Technology, Mechanical Engineering. Minimum 50% marks in class 12th (10+2) with 50% marks in Mathematics. Must have a valid score in National Aptitude Test in Architecture (NATA) or JEE Paper-2 Aptitude Test in Architecture. Minimum 50% marks in Physics, Chemistry & Mathematics in class 12th (10+2) with 50% marks in Mathematics. Minimum 50% marks in Diploma (10+3) in any engineering branch or any equivalent BSc. Degree with Mathematics & Physics as a compulsory subject in class 12th (10+2). ComedK, Christ University Entrance Test. 1 lakh 83 thousand per annum for B.Tech/B.Arch through ComedK entrance exam. Hostel Fees is 45 thousand per annum for accommodation only. 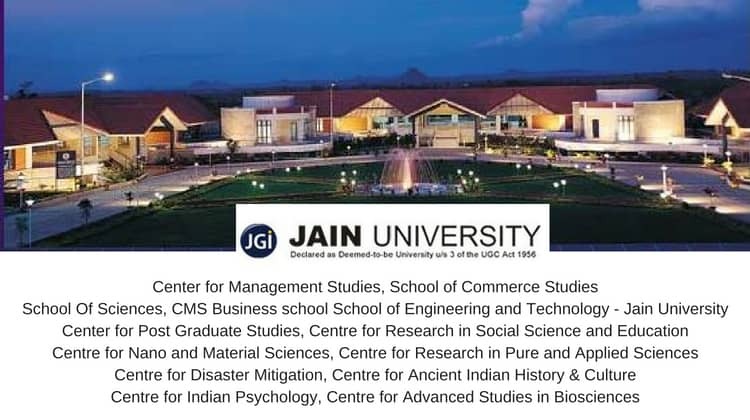 Jain University is formerly known as Sri Bhagawan Mahaveer Jain College established in the Year 1990 and granted autonomy as deemed university in the Year 2009. The Engineering & Technology campus is located at Kanakapura, Ramanagara District, Karnataka. An ISO Certified university by TUV Rheinland. Automobile, Mechanical, Metallurgical & Material, Nanotechnology Engineering. Civil, Construction Planning & Management, Infrastructure Engineering. Artificial Intelligence, Computer Science, Cloud Technology & Information Security, Cloud Technology & Mobile Application, Data Science, Internet of Things, Information Science, Software Engineering. Minimum 60% marks in Physics, Chemistry & Maths in Class 12th (10+2). Allotment of seats is done on the basis of marks scored in Jain Entrance Test [JET] or Uni-Gauge Exams score. Foreign Students, Non-Resident Indians (NRI), NRI Sponsored Students, Person of Indian Origin can also apply for admission. Uni-Gauge, Jain Entrance Test [JET]. Hostel Fees is 90 thousand per annum. Presidency University was established in the Year 2013, under A.H. Memorial Trust. The University campus is spread over 65 acres located at Rajanakunte, Yelahanka, Bengaluru, Karnataka. Awarded as the best emerging B-School in South India by ASSOCHAM. Civil, Computer Science, Computer Engineering & Data Science, Electrical & Electronics, Electronics & Communication Engineering, Mechanical & Petroleum Engineering. Minimum 45% marks in Physics, Chemistry & Maths in Class 12th (10+2). Karnataka CET, ComedK, Uni-Gauge, PUEET, JEE Mains. For Karnataka-CET Students 60 thousand per annum. 1 Lakh 65 thousand to 2 Lakh per annum through ComedK, Uni-Gauge Counseling & Direct Admission. Hostel Fee is 90 thousand Per annum & Caution Deposit 10 thousand. For students having Top 100 ranks in PUCET, JEE Mains qualified students, Karnataka-Cet rank below 25000. Merit-Based Scholarship for Students having 80% and above in Class 12th (10+2). 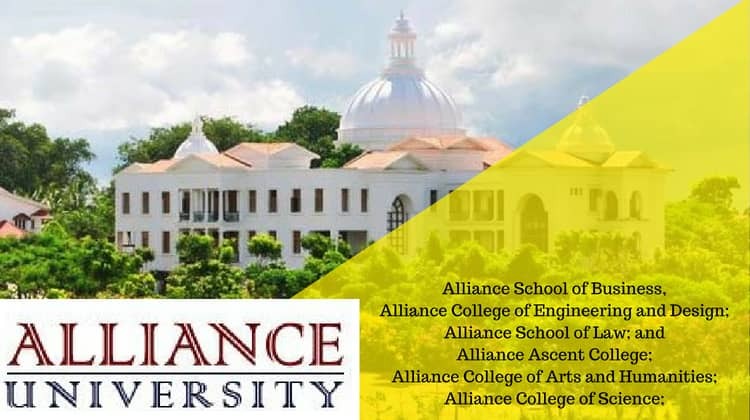 Alliance College Of Engineering & Design was established in the Year 2010, under Alliance University. The University campus is spread over 45 acres located at Anekal, Bengaluru. Ranked as the best private university in South India by ASSOCHAM in the Year 2014 & 2015. Honored with Brands Academy Education Excellence Award in 2013. Aerospace, Civil, Computer Science, Electrical & Electronics, Electronics & Communication, Information Technology, Mechanical Engineering. Minimum 45% marks in class 12th (10+2) with Physics & Mathematics as a compulsory subject. JEE Mains, ComedK, Karnataka-CET, AUEET. 1 lakh 83 thousand per annum through ComedK & AUEET counseling. Hostel fee is 80 thousand per annum. 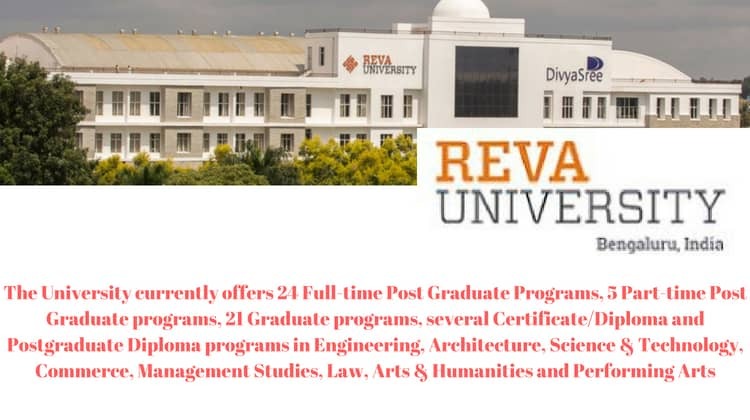 Reva University formerly known as Reva Institute of Technology & Management (RITM) was established in the Year 2005 and granted autonomy in the Year 2013. It is spread over 45 acres located at Bagalur Main Road, Yelahanka, Bangalore. Architecture, Civil, Computer Science, Electrical & Electronics, Mechanical Engineering. Minimum 50% marks in Class 12th (10+2) with Mathematics & English as a compulsory subject or else Minimum 50% marks in Diploma (10+3). Must have a valid score in NATA. Minimum 45% marks in class 12th with Physics & Mathematics as a compulsory subject. For Karnataka CET Students 60 thousand per annum. 1 lakh 83 thousand per annum through ComedK, Unigauge and Reva EET counseling. For Management Quota Seats 3 lakh per annum (Negotiable). Hostel Fee is 1 lakh per annum. Established in the Year 2014, under Mahatma Gandhi Vidya Peeth Trust. The University campus is spread over 15 acres located at Hosur Main Road, Bengaluru, Karnataka. Aerospace, Computer Science, Computer Technology, Electronics & Communication, Mechanical Engineering. 45% marks in Physics, Chemistry & Maths in Class 12th (10+2). Karnataka CET, ComedK, Uni-Gauge, DSAT. Karnataka-Cet Students 60 thousand per annum. 1 Lakh 83 Thousand per annum through ComedK & Uni-Gauge counseling. D-SAT Students 2 lakh 28 Thousand per annum. Management Quota Seats 2 Lakh 98 Thousand per annum. NRI & Foreign Students 7 thousand USD per annum. Hostel Fee is 80 thousand per annum, Hostel facility is provided outside University campus. 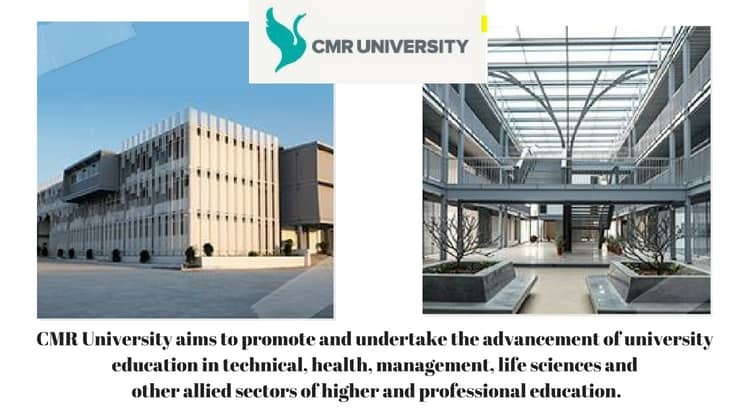 CMR University was established in the Year 2013 under CMR Jnanadhara Trust. The CMR University Engineering Campus is spread over 65 acres located at Hennur-Bagalur Main road. Architecture, Computer Science, Electronics & Communication, Information Technology, Mechanical Engineering. Minimum 50% marks in 12th (10+2) with Mathematics as a compulsory subject. Must have a valid score in NATA entrance exams. Minimum 45% marks in 12th (10+2) with Mathematics & Physics as compulsory subject along with Chemistry/Biotechnology/Biology. For Karnataka Cet students 65 thousand per annum. 1 Lakh 30 thousand per annum through ComedK, Uni-Gauge students. For Management Quota Seats 2 Lakh per annum (Negotiable). Hostel Fee is 80 thousand per annum, Hostel facility is provided outside CMR University campus. 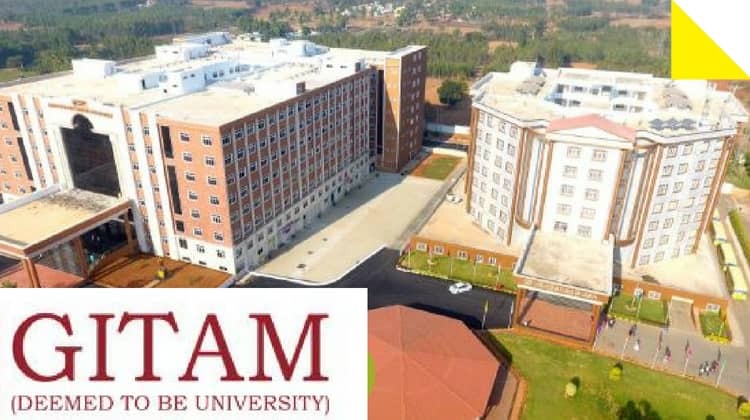 GITAM University also known as Gandhi Institute of Technology was established in the Year 2018. GITAM University 3rd campus is located at Doddaballapur, Bangalore Rural District Karnataka. It has two other campuses located in Visakhapatnam & Hyderabad. Ranked at No. 89 position among top 100 deemed university in India by NIRF 2017. Accredited as A grade college by NAAC and Tata Consultancy Services (TCS). Civil, Computer Science, Electrical & Electronics, Electronics & Communication, Electronics & Instrumentation, Industrial, Information Technology, Mechanical Engineering. ComedK, GAT & Management Quota seats 1 lakh 21 thousand per annum. KCET seats 60 thousand per annum. There are more than thousands of UGC Recognized University for B.Tech Degree in India. Most of these private universities are selling B.Tech degree to the students without any placements. Every year many of these universities are banned by All India Council of Technical Education since they are not providing quality education. Many of the UGC approved B.Tech colleges are known to provide a degree to students without attending classes and writing the exams. Students taking admission in some of these colleges are not only cheated by the colleges but they also spoil their future. 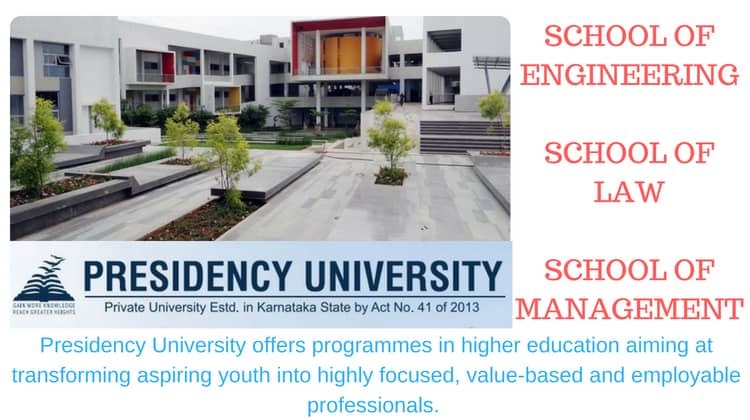 Private University in India can take up to 10 thousand students for any academics session which has increased the number of engineers without any placements or job. Some of the best UGC approved colleges are located in Bangalore which provides direct admission in B.Tech/Lateral Entry. Also, Deemed Universities in Bangalore conducts their own entrance exams or take admission through National level entrance exams. The Private Universities of Bangalore provides quality education following the latest syllabus and curriculum which helps students to get a suitable job are completing the courses. If you are looking for admission in Bangalore Private University, then we can help you secure a seat in some of the colleges listed above. PLEASE MAKE ADMISSION FOR 43%, CAN I GET ADMISSION FOR B.TECH? Plz write 12th exams again or take up the improvement test to secure 45% marks for B.Tech admission in Bangalore. What all courses I can do after BE from Bangalore University? You can study MBA, MTech & MCA after B.E/B.Tech. I m from Nepal. What should I do to get admitted in RVCE? You can take management quota seats in RVCE, Bangalore or appear in ComedK Entrance exam. Which college I can get for engineering through 12th marks without any donation into CSE branch? 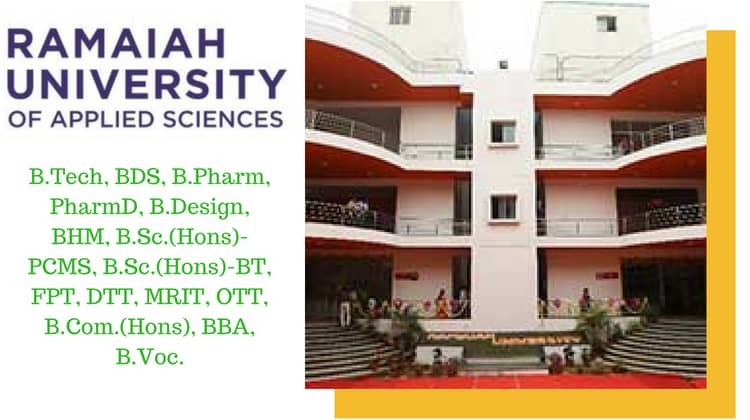 Hi Aman, You don’t need to pay a donation for B.Tech Direct Admission in any of the Top Private Universities in Bangalore as listed above, Contact us on 8546881677 for seat bookings and scholarship. Please tell me about top colleges in Bangalore for direct admission in B.Tech in streams such as CS/IT? Please visit us or contact 8546881677 for admission in Top Engineering colleges of Bangalore.